Most businesses today rely on computers and modern technology in order to run efficiently and to meet the needs of customers whether local or worldwide. The data center plays an important role in keeping the operations of any business running effectively. However, as more business operations shift to computerization, the complexity and capacity of those systems must increase. This growth can put a strain on the resources and energy efficiency of the data center. When that strain leads to data center downtime, the losses for the affected businesses could be hundreds of thousands of dollars. This presents a crucial dilemma for the data center administration: Maintain a balance between energy efficiency and the mission critical element. When a facility has the “mission critical” status, then it must be operational at all hours of the day every day without fail. In a data center, this applies to the air conditioning systems and each server, as well as other crucial systems. It means that any given component of the system must maintain its reliability. In other words, every action taken must have a positive influence on how well the systems in the data center function. In order to maintain or to improve reliability, there are five strategies that data center administration must implement. This is often achieved by maintaining a second set of components which are either running all the time or which would instantly switch on in the event of failure in the primary components. As maintenance is performed on the primary system, the secondary system may need to be operational. The second system of components will also need consistent maintenance in order to guarantee that they will be functional under emergency circumstances. This means that all mission critical components must be available for regular and routine maintenance without disrupting the crucial function of the components. Flexibility is best achieved during the initial design stage of the planning and building operations. In order to protect the critical data housed in the data center, the facility must be able to stand strong in the face of natural elements, man-made disasters, or acts of terrorism. If a data center has undergone “hardening”, then the facility is capable of withstanding those dangers. The architects of data centers must also be aware of emerging dangers, so that their designs will be hardened in the event of any new dangers. Security measures are closely tied to the hardening steps. Data centers are often home to highly sensitive information, so quality security measures must be put into place. The IT professionals who design the facilities’ security measures must also be continually investigating new threats to computer security in order to stay a step ahead of hackers and other criminals. 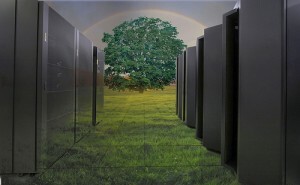 Can A Data Center Obtain Both Energy Efficiency And Reliability? There are several ways that data centers can improve their energy efficiency. With carefully researched planning, many of the measures for improving energy efficiency will also positively improve the reliability of the data center operations. According to the U.S. Department of Energy, there are three significant strategies which can be employed to improve energy efficiency without losing the reliability of mission critical components: employing stand-by modes, implementing energy monitoring software, and installing efficient cooling systems. There are other plans suggested by data center planners and architects which can provide additional improvements to energy efficiency without detracting from mission critical reliability. One estimate suggests that 3% of all the electricity used in the United States is used by data centers. As data centers are used more and more to house online information, this percentage is certain to grow. Reducing the energy use of data centers will prove beneficial for the data centers and for the other energy-consumers in the United States, and across the world. New studies and technology are consistently improving the benefits of stand-by mode. Typically, devices which are running on stand-by mode are drawing on a little power in order to quickly move from inactivity to activity. Traditionally, data centers house servers which are constantly running, creating a great deal of heat, and requiring continual and intense air conditioning. In an energy efficient data centers, servers switch to a stand-by mode when they aren’t in use. This reduces that amount of electricity used, reduces the buildup of heat, and decreases the necessity for air conditioning. The appropriate us of energy monitoring software have dramatic benefits in reducing the energy usage of a building or company. This happens as the software monitors patterns in energy use, tracks utility bill problems, isolates spots of inefficiency, and recognizes areas where energy is being wasted. Utilizing the right software may mean that the data center is able to monitor losses from mistakes on bills to comparing the amount of energy used at different times of the day and in different areas of the facility. There are many methods employed by data center planners to improve the efficiency of the facilities and the cooling systems. Some plans involve recycling warmed air throughout the buildings’ heating systems and some plans involve structured ventilation to maintain cooler temperatures. It should seem reasonably clear that improving energy efficiency allows more resources to be diverted to reliability. Reducing the dangers created by over-heating also improves the safety of the information housed in the data center. Money originally allocated to paying energy bills could be spent to research better ways to increase security for the facility. Improving the overall energy efficiency of data centers can reduce the number of man hours required to manage the data center and this reduction in human traffic at the data center can also improve the level of security at the facility. These examples and many others illustrate how mission critical elements improve as the energy efficiency of the data center increases.